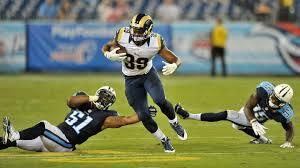 Malcolm Brown is a running back for The Rams. Brown has racked up 22 carries in his two seasons. Sean Mcvay has been very impressed with his performance at the training camp so far. Lance Dunbar has had a string of injuries. He is currently on the physically unable to perform (PUP) list. He has missed 26 games in his five seasons, so we can expect to see Brown have an increased presence at camp. Todd Gurley is still the clear starter. He However, when Gurley needs a break, McVay is sure that he can count Brown to be the shoulder.